This is a work-in-progress animation of a horse in the style of the Liberated Pixel Cup. I've tried to match the size and style of daneeklu's LPC style farm animals. The galloping horse movement is based on this public domain image by Eadweard Muybridge: The Horse In Motion . This submission contains an east-facing galloping animation (11 frames), stationary poses, and walking animations (north, west, south, east). 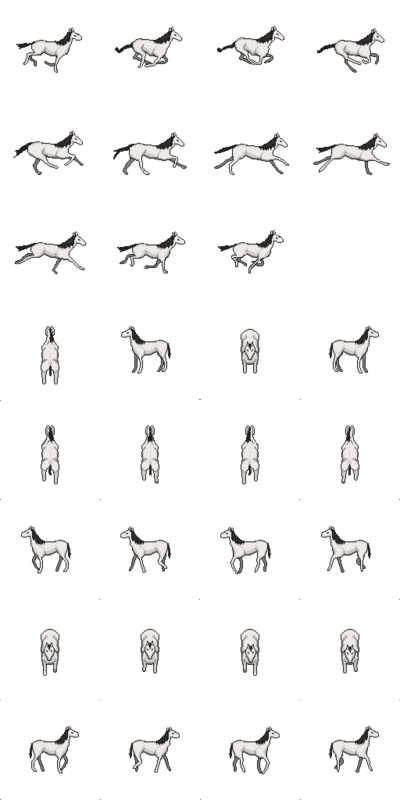 The galloping animation looks best at ~20 FPS and the walking animation at ~6 FPS. This is my first sprite/animation, so I am very interested in feedback; I particularly struggled with the head/face and with the forward-facing walking animation. Also if anyone knows an easy way to make a GIF from the spritesheet for the preview, that would be great! I plan to add some additional shading/detail to the face, mane, tail, and feet, as well as additional animations (north, west, south galloping; north, west, south eating), but I wanted to post this and get feedback first.